Among the top two calibers during the time of the cowboys was the 44 caliber. With this massive, powerful round, they defended themselves against the numerous villains of their day. Although it is no longer really used for self defense, the 44 Magnum presents itself as a phenomenal range and hunting round. 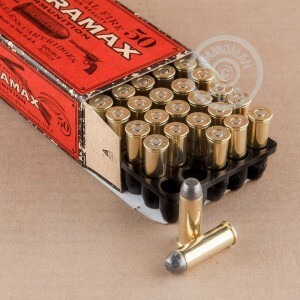 When you buy from Ultramax, you are helping a relatively young, American company keep jobs in the United States, as well as getting high quality, American made ammunition. 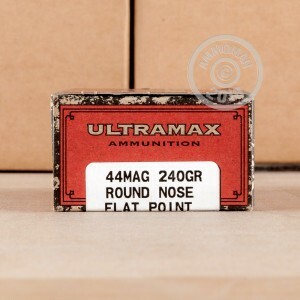 With these lead flat nose rounds, experience the difference that comes with flat tipped ammo. When the flat nose hits the target, it makes a nice round hole, which makes scoring a breeze. 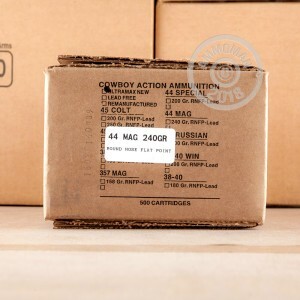 Firing at 710 feet per second, you won't have any trouble out of these American made, 240 grain rounds.